Days 278-281: MLwC and can we stop eating ourselves out of house and home? Jared Diamond, of Guns, Germs and Steel fame, wrote another book that got its share of acclaim but not nearly the read GSG did, for some reason. The other book, Collapse: How Societies Choose to Fail or Survive basically chronicles our species’ historical tendency to consume itself out of house and home, with some notable exceptions which he also chronicles. Of real interest to me today, in light of Jakarta’s government sponsored and orchestrated project to plant 79 million (Million!) trees to counteract the deforestation of their small island. Jakarta has the highest rate of deforestation in the world, and may well be–at least for its size–a record breaking carbon producer as it slashes and burns its way to “monetization” and simultaneously drains and harvests some of the largest peat wetlands in the world. The country is possibly in the running for real-time environmental collapse and is–credit where credit is due–trying to do something about it. That brings me to the title of the blog and point 2 and 5 above. Diamond chronicles how many societies from ancient to modern use the resources around them to survive and reproduce. Inevitably, certain resources cannot be regrown or resupplied as quickly as we can reproduce and therefore the resource drain increases incrementally until the foundation upon which a society is built–based on resource usage–literally collapses. He uses a number of well known examples from long ago, the Anasazi, Easter Island, the Greenland Norse and others. In its simplest terms, the dependence on wood for heating and cooking was a critical mistake: the wood in these areas was slow growth and dependent on a fragile environment. In these cases, it is quite likely that the populations literally ate themselves out of house and home. Point 5 above is all about situations wherein a population recognizes the danger signs and responds. He has fewer examples of this than he does of the other point which makes for a gloomy read all around, but there are examples: Tikopia in the South Pacific, New Guinea and a forest region in Japan. There are arguably others that are actively trying to stave off the effects of resource depletion all over the world, places like Costa Rica with some successes and still plenty to do, and Kenya (see the awesome Wangari Maathi), and now perhaps…perhaps add Jakarta. Some are calling this tree project a sort of window-dressing on the real problem: the black market for the exotic woods that grow there. Until the market declines or more viable options assert themselves, the slash-and-cash economy will continue to flourish. But let’s take an optimistic view for now…you never know. One small act leads to another and another and another. A video of Diamond lecturing on this topic can be found here. 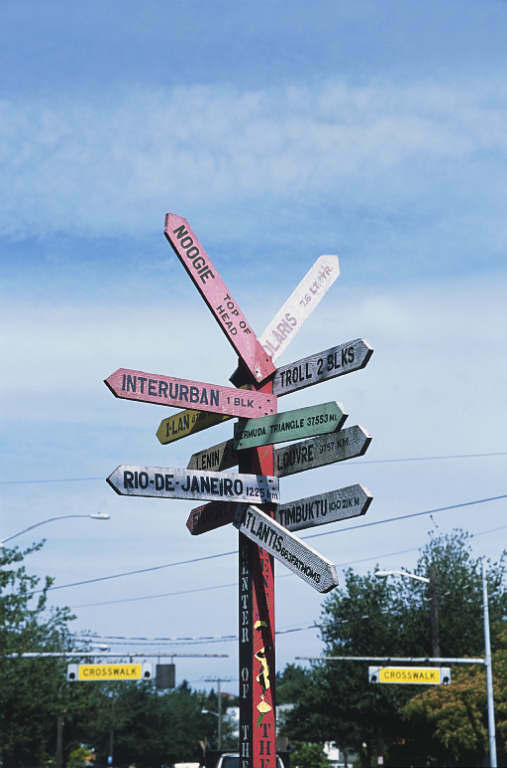 Neighbor Susan sent me the directions for taking the bus to Fremont yesterday….but too late! I’d already been and back, and it all took a lot less time than I thought. Two buses there, two buses back, little waiting and a lot of sight-seeing on the way. That’s the thing about riding the bus–you actually get to look at stuff. While on Dexter to Fremont, I had the chance to see the new condo corridor that comprises the west bank of Lake Union. Urban living at its best–it’s actually a vibrant, attractive community. Where once there were few people out walking or riding bikes, now there are outdoor cafes, sufficient population density and plenty of walking traffic. And then there’s Fremont (aka Center of the Known Universe. Please set your clocks back 5 minutes.). Fremont has never been without its vibrant community, and while a long time ago when Adobe moved in I dreaded a lot of the things that were happening because traffic became even more impossible and the funky little hood was suddenly a lot more glitzy, somehow Fremont has maintained its predictable quality of weirdness while supporting a level of sophistication. The transition period in the late 80s and early 90s was a painful series of miscalculations (the old PCC was dreadful; the new PCC is divine, however), but the new Fremont is a walker’s heaven, and if you like Thai food, there’s nowhere better to go. And don’t forget Peet’s. In a town bristling with Sbux, it’s nice to find a Peet’s coffee where you can settle in for a good long while at the epicenter of the Center of the Known Universe. So, I’ve branched out on the bus front. On the gray whale front, I’m still thinking about and following the issue with the rogue hunt team from the Makah tribe out of Forks, WA. Previous post here. On Sunday, the Makah tribal council denounced the action and will prosecute the hunters to the fullest extent of tribal law. At the same time that this event has been in the news, studies regarding the “success story” of saving the gray whale from extinction have been thrown into question by recent studies; it appears that there is maybe only a third of the population recovery previously reported, and that the populations are not healthy, some are even emaciated due to vastly diminished food sources. It’s a systemic issue: global climate change impacts food sources, over fishing impacts food sources, over fishing is related to population increases, and on and on. We are First Nations whale conservationists who regard whales as our sacred brethren. The heinous poaching of a gray whale by five Makah tribal members pains us deeply [“Gray whale shot, killed in rogue tribal hunt,” Times page one, Sept. 9]. No tribal tradition we know of would condone the ruthless killing of this whale. The poachers desecrated an ancestral whaling legacy, compromising it beyond redemption. Their selfish, cruel act betrayed whales and the Makah Tribe. Inflicting mortal wounds that cause an animal to bleed to death over 10 hours; killing out of frustration with bureaucratic delays; putting ego and self above community — such behavior mocks traditional Native values. The poachers’ blatantly illegal actions warrant full prosecution in Makah tribal court and under the Marine Mammal Protection Act. The time is overdue for Makah elders, culture bearers and tribal leaders to reassess the viability of whaling in the 21st century. Imperiled by global warming, habitat destruction and other monumental threats, fragile whale populations will not endure for the next seven generations if only select groups of humans commit to protecting whales, while others persist in exploiting whales. I’ve written about Wildlife Alliance (nee WildAid) before and just checked their newly evolving site to see what they’re up to. It’s a good site, with lots of interesting drill-down…one of them being The Tiger Mosaic. You have got to check out The Tiger Mosaic. 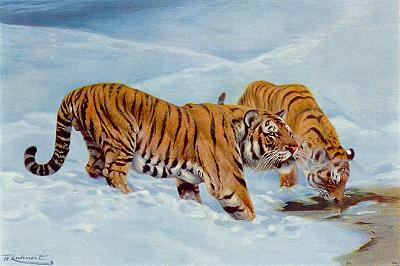 As most probably know, Tigers and other endangered animals are being hunted to extinction for fur and mythical aphrodisiac qualities–the most ridiculous and unenlightened thing I can imagine: killing an animal for its fur or body parts for their “special powers.” Good lord, people, will we ever evolve? But back to The Tiger Mosaic: this is very cool. By signing up, you submit a picture of yourself that will become part of a massive (truly massive) mosaic depicting the tiger’s gorgeous countenance. The mosaic itself is amazing–go there if only to check that out. Also notable: our tax dollars at work, check their partnership with DFW (Dept of Fish & Wildlife). 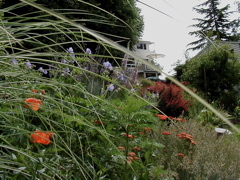 Wildlife Alliance is an exceptional organization–very smart, very efficient, very passionate. Hang out in their site for a little while–it’s beautiful. My Mom called and said, “you have to get this sauce: Frank’s Red Hot.” Why? Because cayenne will cure just about anything and it’s the best hot sauce she’s ever had. Hmmm. She said it’s curing her arthritis–and that has some basis in fact, apparently. They don’t sell Frank’s at our local organic food store, couldn’t find it at the other market we frequent. But they did sell it at Safeway–a store I never frequent for lots of old, Chavez days reasons–so we picked up two bottles and tried them tonight. 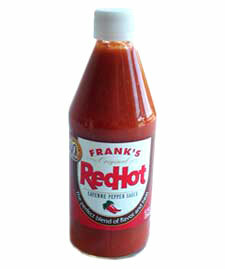 The weird thing: Frank’s Red Hot has got the most basic ingredients you can imagine. Cayenne, vinegar, salt, water. That’s it! So how come my back-to-basics grocery store doesn’t stock it? And also: it’s cheap! Maybe that’s why–they don’t give away shelf space for nothin’. What else is going on? John Lombard wants to save us from ourselves: he’s single handedly trying to raise awareness about the degradation of the Puget Sound, the destruction of salmon habitat. I’m still really unclear about how come salmon is a common dinner entre when its numbers are diminishing at an alarming rate, but here’s a site that explains how to eat salmon if you are inclined, while still protecting the environment. Saw “My Name is Rachel Corrie” at the Seattle Rep the other night and was blown away by it. It’s closed now in Seattle but has already hit the road and is making a wave in EU international tour. This is about the young American woman who was run over by a bulldozer and killed in Gaza in the Palestinian camps. She was a writer with wonderful journals she kept from 5 years old on–the play is based on those journals, right up to the last 5 minutes of her life. Wonderful, amazing–one woman show. The pamphleting outside the theatre seemed a gross continuation of the same politics that killed this young woman and kills young innocence the world around. Made me sad. What else? We just put organic compost on all the beds in our yard (we have a lot of yard) so spring must really be here even though the temperature is so abnormally low, the evenings still dropping to the high 30’s. Also, the local Farmer’s Market started–paltry pickings, it’s still too early for much produce, but it’s a great thing to have it back! Support Your Local Farmer’s Market! And I think that’s all for now.